Socrates was a classical Greek philosopher. He was attributed as one of the noteworthy founders of western philosophy, also known as one of the main sources of the moral philosophy of the western ethical tradition of thought. Born in circa 470 B.C., in Athens, Greece, his ‘Socratic method’ contrived the preliminary work for the Western system of logic and philosophy. Minimal is known about Socrates’ life, which was mostly recorded by his students, inclusive of Plato and Xenophon and plays of Aristophanes. These records had other grounds than outlining his life, none having the accuracy to make a complete picture but a unique portrayal of Socrates’ life, personality and philosophy is understood by them. Socrates father was an Athenian stonemason and sculptor. He clearly did not come from a noble family. He acquired basic Greek education and practiced his father’s profession at a very tender age. Socrates too, worked as a mason for many years before he devoted his life to philosophy. Considering his poverty as evidence, it is said that both Socrates and Plato did not accept payments for teaching. He married a way younger woman, Xanthippe, with whom he had three sons with, namely, Lamprocles, Spheniscus and Menexenus. Least considerate about his sons, Socrates has expressed his interests in the development of intellects of young boys of Athens. Socrates was also known for his courage and bravery, as he served in the armored infantry called hoplite and indulged in three campaigns during the Peloponnesian war. When his trial was over, he differentiated his refusal to withdraw from his legal issues to a soldier’s to withdraw from battle when threatened with death. With the altering in the political situations of Greece, he was sentenced to death by Hemlock poisoning in 399 B.C. He accepted this judgment instead of bolting away into banishment. Socrates had a sudden attraction towards brilliant debates and different ideas, instead of a physical ideal. His main emphasizes was on the importance of mind relatively over the unimportance of the human body. Socrates separated reality into two different realms, that is, the world of the senses and the world of ideas and declared that the latter was the only one important. 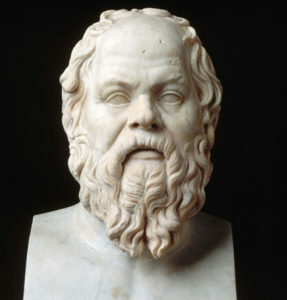 Plato’s philosophies were inspired by Socrates. Socrates strived to form an ethical system rooted in human reasoning instead of theoretical doctrine pointing out that the human alternatives were inspired by ones desire for happiness and that wisdom comes from knowing one’s true self. The potential and capacity to make good choices and to reason, that brings one; true happiness is greater when one understands his or her true self. Once a person figures out his or her true self, it becomes easier and less difficult to make the best choices and their abilities to reason increases. It was believed by Socrates that this thought later turned into politics with the supreme form of government is neither a tyranny nor a democracy. In fact, the government when ruled by an individual or group of people who possessed the ability, knowledge, and education, were successful because they completely understood their own true self. Socrates thrived to understand political and ethical truths. So, he took Athens to be a classroom and went about asking similar questions to the bourgeoisie and the common people of Athens, to arrive at conclusions. He asked people such questions that compelled one to think and conclude a problem with a logical answer. For this reason, he was admired by some and vilified by others. Socrates went about barefoot with long hair and did not bath in a society with impeccable standards of beauty in Athens. Athenians strived for a higher social status and despite his intellect and connections; Socrates turned them down and gave shape to his spirit of questioning every supposition about having a good life, virtue, and wisdom. Socrates made his students put a thought on one of the greatest contradictions of doing wrongs despite knowing the correct thing to do, that is if the weakness of willpower truly existed. He strongly believed that people tend to do wrong things when they understand that the benefits are greater than the loss of moral ethics. He called the development of personal ethics an “art of measurement”, where one analyses the benefits and losses of one’s decision making processes. Socrates was the wisest man in Athens as declared by the Delphic oracle. Understanding the limitations of human knowledge deeply interested Socrates. He along with his followers enlarged the basis of philosophy by attempting to bring out one’s inner values and their questions and definitions pushed the developments of formal logic and systematic ethics. He was distinctively known as one the greatest philosophers of all times and portrayed as a religious figure also called, quasi-saint.